Tower climbing safety gear is available from a large variety of manufactures or vendors in many sizes, styles, shapes, colors and materials. This list is intended as a guide for the beginner climber to assist in getting started. As you gain confidence and knowledge in your climbing abilities your equipment choices will become personal preference. Vertical Safety Solutions LLC does not endorse or promote any particular brand or product. Climbing Basics is at a minimum equipment and knowledge you will need to get started. 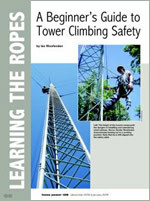 It is recommended that you attend a tower climbing safety course. Full Body Harness is designed to distribute any force applied during a fall through out the pelvis, thighs, waist, chest and shoulders. It is also used as attachment points for other climbing equipment components. A full body harness may include hip, saddle, chest, shoulder and back D-rings. Ensure that you understand the use and limitations of all D-rings on your harness. The back D-ring “aka” dorsal ring should only be used for attaching a shock absorbing lanyard used as fall arrest while working stationary or while face climbing a tower with no safety cable. The back D-ring also comes in handy when your harness is stored in a box or becomes tangled with in its self, simply grab your harness by the back D-ring and shake it out. More times than not it will shake its self loose and fall into place to better see where your arms, legs, and head go. The front chest D-ring should be used to attach to a lad safe climb device. This is usually a cable attached to the tower for climbing that provides 100% fall protection. Hip rings should be used for your position lanyard and or a spreader bar which can be used for a variety of lanyards. If your harness has saddle rings these should be used for a seat “aka” a saddle, this allows a worker to situate themselves in a sitting position for comfort while working on the tower for extended periods of time. When not using a saddle the D-rings work great for carrying your tool bag up the tower. Shoulder D-rings are designed for climber rescue from confined spaces but can come in handy as an extra place to carry items of need up the tower. Always wear the proper size of harness that fits you snug but not to tight. The back D-ring should be between your shoulder blades. There are two types of chest strap harnesses; some form an H pattern while others form an X pattern. There can be concerns with the H pattern if not worn properly and it is suggested that female climbers may prefer the X pattern. Generally, the chest strap D-ring should be positioned between the bottom of the sternum and the belly button. Pay special attention to the location and snug fit of the groin straps. “Aka” leg straps. If you fall while in the harness the weight is distributed to the shoulders and hips and the groin straps will pull up hard. Any slack in these straps will cause intense discomfort while hanging after a fall. Many manufactures offer padding in the leg and shoulder straps. This is also known to provide more comfort while working on a tower. The waist belt is not generally used as a fall arrest system but for positioning. The belt should fit so that it does not put pressure on the small of the back or your kidneys. The hip D-rings should face forward from your hips and not backwards toward your buttocks. The saddle is your final adjustment. This is used primarily for work position and should swing freely behind your body when climbing but be close enough to attach your self to the tower and sit in the saddle with out the sensation of falling into your saddle. NEVER punch additional holes or alter your harness or climbing equipment in any way. Store your climbing gear in a dry clean area when not in use. Inspect it often for defects. Read thoroughly all instruction and inspection manuals that are provided when you purchase climbing equipment. Always remember a climbing harness is to protect you in a fall. Treat your harness as if your life depends on it. Vertical Safety Solutions LLC personal preference is an Exofit XP Tower climbing harness by DBI Sala. We do not endorse this product just simply prefer it to others on the market. Lanyards are specifically designed to their uses. There are lanyards for positioning or for fall protection “aka” fall restraint (to restrict falling, to reduce the distance of a fall to a minimum) they come in various lengths for use with your body harness, they can be constructed of rope, cable, webbing or chain. Positioning lanyards are used as to fix the worker in a stationary position on the tower so that he/she is close enough to their work area with stability as to prevent a fall. (Fall restraint) Position lanyards are available in lengths from 18 inches up to 28 feet. They can be of fixed or adjustable lengths. It is more so the goal of use that determines what style and length will be effective for you. Vertical Safety Solutions LLC personal preference is a fixed 4 foot rope style. We do not endorse this product just simply prefer it to others on the market. Shock absorbing lanyards are used as a fall arrest device. (Fall Arrest: to control and stop a fall once it has begun.) These lanyards are available in 3, 4, 5, and 6 foot lengths made of nylon webbing with a built in shock absorber that extends only under stress (the weight of a fall). The shock’s purpose is to absorb and control the deceleration distance created by sudden weight being applied to the lanyard. Your shock absorbing lanyard should only be hooked into your harnesses back D-ring. Shock absorbing lanyards come in one line or two line (Y Shape) Since you should be hooked to the tower at all times by any means available we find it quicker and simpler to use a Y shape two line. Vertical Safety Solutions LLC also prefers to use a 3 foot length due to the lack of places to hook off once you climb above the base of most wind generator’s. Remember, although you do not want to fall at all, OSHA says you are not allowed to fall more than 6 feet before your fall arrest device (Lanyard) stops you. All though it is of our opinion that it should be of individual choice as to wear or not to wear a hard hat or helmet in any situation, it is required by OSHA 1926.100(a) that employees wear hardhats to lesson the effects of striking their head against an object. It is also of our opinion that any one on the ground in the drop zone area of a tower that is not wearing a hard hat, most likely has all ready been hit in the head and lost their senses. While tower workers know better than to throw things off a tower, tools and other items can slip from their grasp and fall to the ground. While a traditional Hard hat may be easy to retrieve if it falls off while on the ground. A tower worker may get tired going up and down the tower just to retrieve a hard hat. 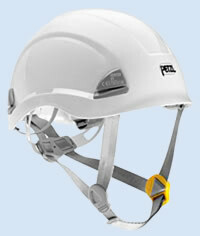 Vertical Safety Solutions LLC prefers a chin strap helmet made by Petzel. You can purchase these with or with out air vents. We prefer the air vents. We do not endorse this product just simply prefer it to others on the market. Over time you will discover that you can never have too many carabineers. You can attach to many different things such as; lines. tools, bolt bags, lad safes etc, etc, with a carabineer. Equip your self with a variety of mouth opening sizes as to easily adapt to any size situation. Be sure to purchase weight rated carabineers and not the cheaper rock or key chain type that are not rated for heavy weight. Carabineers can be costly but you will find their versatile uses priceless. A tool bag will come in handy to put your needed tools and other items in to carry up the tower with you. A heavy canvas style with a rope handle and snap ring for easy attachment to your harness will work fine. The snap ring with a carabineer attached will also allow you to hook your bag to the tower for easier reach of your tools. Vertical Safety Solutions LLC Reminds you to Climb Safely and be attached to the tower at all times by any means available. If the tower has a safe climb cable attach to this with a carabineer and lad safe during your climb. Before you unhook from the cable attach a lanyard first. ALWAYS have a safety line hooked before removing another. No safe climb, use a two line (Y Shape) to face or ladder climb. Remember Hook a new line before unhooking the other. Climbing a tower can be physically demanding and exhaustive on your body. Do not be in a hurry to get to the top. You don’t want to be tired when you reach your work place. When climbing use your leg muscle to push you up and not your arm muscle to pull you up. Drink plenty of water and remember, it is in your best interest to climb back down the tower and not fall down from being dehydrated or exhausted. Someone, somewhere needs and loves you, your primary goal on every job should be climbing and working safely for that someone. Vertical Safety Solutions LLC offers a beginner course in tower climbing safety and techniques. For more information on climbing towers or climbing equipment please contact us. To learn more about basic tower climbing safety we, suggest; A Beginner’s Guide to Tower Climbing Safety by Ian Woofenden.